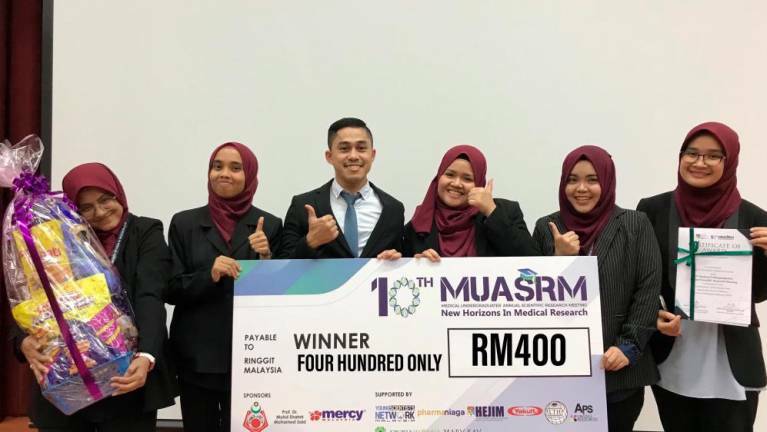 04 Dec 2018 / 11:28 H.
Five Management and Science University (MSU) students were presented the First Winner for Best Research award at the 10th Medical Undergraduates’ Annual Scientific Research Meeting (MUASRM) this November 2018. All five are MSU Bachelor of Medical Sciences (Honours) programme students who submitted their final-year project on The Efficacy of Piper Betel Extract as Natural Larvicides against Aedes Aegypti Larvae, for the competition. Kudos to the team comprising Afrina Ariff, Che Nur Azni Nazira Che Md Rozi, Noralaina Yahya, Nor Atika Abdul Razak and Nur Alya Ayarafina Moh Salleh, who apart from taking home the award, also received cash and a hamper. The student’s supervisor, Dr Muhd Ridzuan Pauzi described the win as an achievement exemplary of the research opportunities and facilities at MSU, especially at MSU International Medical School (IMS). With pride, he mentioned of the competition at MUASRM which is organised by UKM’s Faculty of Medicine, and open to all medical schools in Malaysia. 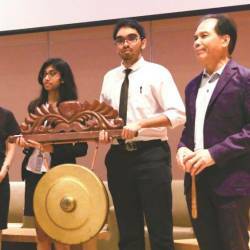 Another feather in the cap for MSU is when it hosted the third edition of the Invention and Innovation Competition for Private Institutions of Higher Education (PERINTIS 2018), where 21 out of 49 submissions went towards the Health Sciences, Medical and Pharmaceutical category. 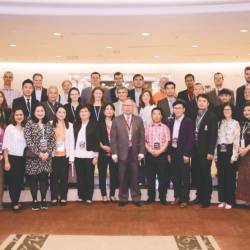 It was a proud moment for the MSU Medical and Sciences students from the International Medical School (IMS), the School of Pharmacy (SPH), and the Faculty of Health and Life Sciences (FHLS). In fact, MSU’s IMS Bangalore campus is known as the first offshore medical school to be awarded a full five-year accreditation by the Malaysian Medical Council (MMC). And MBBS students have an option to transfer to IMS Bangalore from the IMS main campus in Shah Alam. Blending technical vocational education and training (TVET) with traditional academic curricula, MSU enhances competencies with industry internships, community and creative entrepreneurships, as well as global exposure - all which prioritise student development for better graduate employability. Furthermore, the school’s highly qualified academics and international visiting professors support a holistic curricular framework that delivers compelling learning experiences. A tracer study by the Malaysian Ministry of Education (MoHE) also reported that 98% of MSU graduates are successful at securing employment within six months of their graduation, simultaneously awarding MSU the top spot in the graduate employability register among the nation’s higher education institutions. As an applied and enterprise university, MSU offers programmes of study at postgraduate, undergraduate and foundation levels, through connected pathways that admit students from all backgrounds across all walks of life. Dr Muhd Ridzuan with MSU’s winning team. 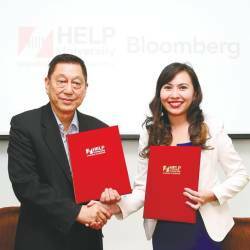 Chan with Bloomberg Malaysia head of sales, Wendnia Tan, at the opening of the ‘Lab’. From right: Abdul Aziz, IMU student and IMU Psychology Club secretary Darvin Anandaraja, IMU 2nd-year psychology student Amutha Aruvi Kaniamuthan, Ng, Psychology Department acting head Dr. Shamala Ramasamy and IMU Community Engagement director Prof. Khoo Suan Phaik. BERJAYA UC chief executive and vice-chancellor Emeritus Prof. Walter Wong (centre) with FRIENDS delegates from the 16 higher learning institutions.